Silver Palate started 35 years ago, when a wondrous jewel of a food store was opened on Manhattan’s Upper West Side by Julee Rosso & Sheila Lukins. It opened with a pure and simple idea—to prepare delicious and great looking food from only the best natural ingredients available. It was a one-stop magic for a home cooked meal. They cooked fresh every day, used the best, highest quality ingredients and enjoyed the enthusiastic support of the neighborhood. With their commitment to constant quality, their reputation grew and as word spread, the idea was born to package some of the condiments—like Good Old Apricot Mustard Sauce, Balsamic Country Salad Splash, Sweet & Rough Mustard and Spiced Cranberry Apple Chutney. The secret was that if you could marinate, glaze, sauté, spread, dip, splash, toss or drizzle any of the condiments on meat, poultry, fish or vegetables, they would magically give a home cooked meal a truly exciting flavor. Thus was born The Silver Palate Kitchen’s line of original Salad Splash dressings, cooking sauces, dessert toppings and chutneys made by hand, in small batches, under the most rigorous standards. Today, the tradition lives on. The times have changed, but Silver Palate’s commitment to great food made of the highest quality ingredients has not. They continue to offer a broad line of products updated for today’s tastes. 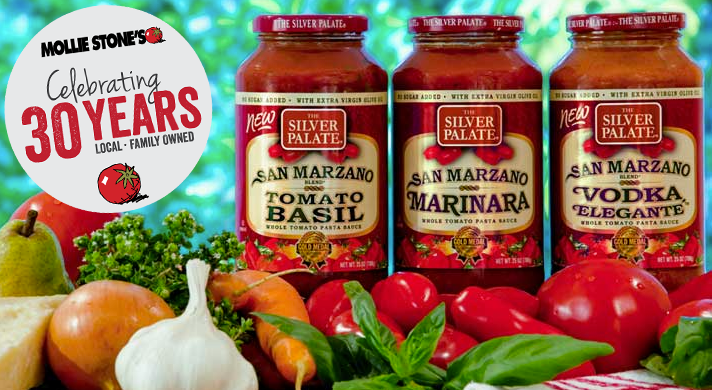 Find select Silver Palate products on ad from April 27, 2015-May 3, 2015 at your local Mollie Stone’s today (store locator).